Help guests easily find their way to your wedding ceremony and reception with wedding direction cards from Invitations by Dawn. Most of our direction cards feature a map on the back so guests have everything they need to find your wedding without any trouble. 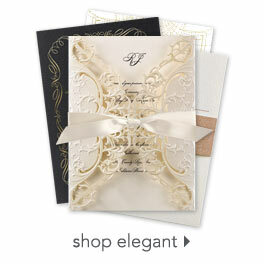 Wedding direction cards are easily personalized and come in a variety of stylish designs, which means they'll coordinate beautifully with your wedding invitations and response cards. The entire ensemble will be an impressive representation of your wedding style and special day.